In recent years, Valmont Irrigation has been working on a research project entitled 'Circles for Rice', and they are now ready to report on the first and second year yields. 'Circles for Rice' is a research project in which rice is produced under center pivot irrigation and linear irrigation systems in an effort to conserve energy and water, as well as expand the area in which rice can be produced. Over the past two years, five production fields in Brazil, Pakistan, and the United States have been managed by the 'Circles for Rice' team. Results of the project show that an average dry yield of 8.9 tonne per hectare was achieved in 2008 and 2009 in the United States and Brazil by growing long-grain rice. In addition, growers in Brazil and Pakistan were very pleased with the yields they harvested under their Valley Irrigation center pivots, and were more profitable with their pivot-irrigated rice than with their flooded rice. Almost all Circles for Rice production fields produced much the same yields as flooded fields in the areas, but used significantly less water. 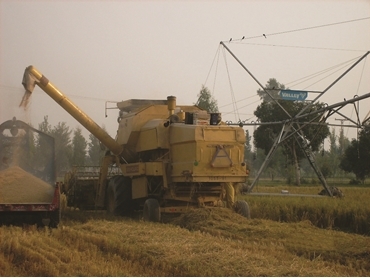 Through the Valley center pivot in Pakistan, the aromatic Basmati variety of rice received 205 mm of water per tonne of rice produce. The flooded field in the immediate area, however, pumped 412 mm of water per tonne of rice produced. the center pivot, compared with the adjacent flooded field, which pumped 43.8 mm of water per tonne of rice produced. The 2009 harvest has paved the path for the next steps in the initiative to conserve water and expand rice production. The Circles for Rice team will continue developing rice production techniques under center pivots and linears throughout the coming years via research and production scale trials worldwide.